A year ago I had approximately 75 or so subscribers on YouTube but I now have over 35,000 subscribers. How did I accomplish this, you might ask? So what is the first step to kicking off this 90 day challenge? First, decide which medium is best for you. I, for example, love making videos and it’s really easy for me to sit down in front of a camera and just start talking. 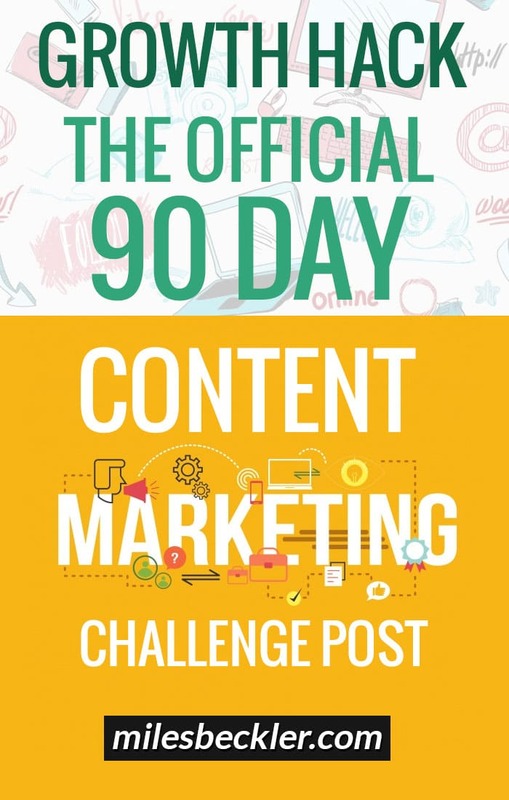 My wife, however, is a blogger and when she did this challenge, she wrote 90 blog posts in 90 days. Maybe you’re a podcaster or maybe you’re a YouTuber like me. Once you’ve picked your medium, your goal is to publish one item per day, every day for the next 90 days. This challenge will help you grow. One of the biggest challenges that people face when growing a business online is the temptation to stay in content consuming mode. We want to read more. We want to learn more. We want to know how all of the pieces of the business puzzle fit together. But the truth is, we can’t figure out how the pieces fit together until we just start creating our own content. Imagine driving a car from Los Angeles to New York—you don’t need to know every single turn. You don’t need to know every single direction to take. You just need to know how to get started. And that is one of the most important things that the 90 day marketing challenge does for you. It forces you to stop consuming content and to start creating content. This challenge also forces you to grow as a creator. When you first start a new workout routine it is really really tough. But as you go to the gym every single day, it gets easier; you build muscle. And then here's the kicker. It starts to become fun. When it starts to become fun, you get excited about putting out content on a regular basis. Then you start seeing growth and reading the comments and you realize you have just built an audience. Which brings me to the important point—this whole game is not about you. It's about providing a service for your audience. When you get to that point of providing a service for your audience, magical things start to happen. This 90 day challenge help you grow as a creator and help you better serve your audience. This content marketing challenge will also help your business grow. If you are creating great content regularly, then your audience members will regularly Google your site and visit your site regularly. Once this happens, Google will notice and begin to prioritize your account. If you put out good content, users are engaging your site, and then those same users continuously come back to your site, Google is monitoring those visits. The bottom line here is that if you want to build and engage your audience, you just have to start creating content. That’s what I’ve proven is possible here. I started this channel with zero subscribers just over a year ago and now my website gets 80,000 hits a month and I’ve done the exact same thing with my wife’s business. The 'How To' behind creating content fast. Your content has two main goals. First, you do want to be sure your content gets picked up by the search engines and second you want to be sure that users find your content helpful. There are 3 main tools or skills you will build that will help you create content FAST! This is the process of researching the exact phrases or topics your audience is searching for answers on... Click here and open my exact 'how to' keyword research training. SEO is a BIG topic and there are two main resources for you... First, my Ultimate Guide To SEO post. Second is my live SEO class you can access FREE by clicking here. Third is creating optimized content FAST! Putting keyword research and search engine optimization together into a great blog post that offers value to your audience FAST is the trick! Do this over and over again every day for 90 days and you are well on your way to building a very successful business online. I also want to add is that your first few videos are going to be a little rough. You should go back on my YouTube channel and watch some of my older videos. It’s humbling to watch those videos. But now I’ve been able to travel across the world, speaking publicly with relative competence. I have a friend who watched the growth of my channel over the last year and she has felt the urge to start creating her own content. Recently we were at an event together with 40 or so other digital marketers. She announced to the group that she was going to do the 90 day marketing challenge. She decided to start that day before going home and 4 or so others joined her in the challenge! Decide To Commit and Start. So throw your hat over the fence get started. If you are going to do this 90 day challenge, I assure you that this is going to be tough. Just remember that very few people are going to watch your early videos. Just like when you start going to the gym, no one watches you lift weights. But if you want to build muscles, you have to get in there and start lifting. Get started on that 90 Day Challenge, I’m excited to see you on the other side 14 months from now! Leave me a comment below and let me know you are starting. I started on Monday, only 3 days ago and I'm challenging myself to write 1 blog post, and 1 youtube video everyday - in the hope that if I fail to get one done, I've at least done the other. Going for it! I love it... Are you using Trint.com to transcribe the videos to make the blog writing easier? I'd focus on building a system to get both done in as little time as possible. Generally, I'm shooting a video as the idea comes to me, giving a brief overview... and then expanding on those ideas inside the blog post and providing more detail. Using the video as a TLDR. Just started today! My website I'm posting to isn't actually the correct website, I just wanted to get going. This weekend I'll figure out how to add my blog to deptfordfence.com and then will move those posts over. Starting tomorrow I will be posting daily on the crazy squirrel site. That site will focus on running a fence company. Right on! All the tech can fall into place over time, but putting out the content every day is the biggest new habit for sure! Glad you are joining us on the challenge! Right on... And it is normal to be a little nervous but stay fired up... So I'm curious. Did you get started? I'm not sure about which media is the correct format, but I feel more inclined to blog as it better suits my personality. Is there a hashtag that is pertinent to you and/or this challenge? No hashtag, just a bunch of individuals around the world head down, putting in the work! Following what best suits your personality is HUGE! Go for it Chuck and remember you can always adjust your approach as you go. I love this... I'm trying to build up my own freelance business creating content particularly around marketing and I want to eventually get my name out there to start working for small businesses. I naturally lean towards writing and blogging but I am also trying to create a portfolio for myself on Instagram and get noticed there. Personally, I would be sure to spend no more than 15 minutes per day on Instagram! Right on! Glad to hear you're taking action and the rhythm is forming… That's the key right there! Hey, great post. I'm re-inventing my local web design business. I mainly do websites and some online marketing(seo, facebook ads, ppc) for small businesses. Any tips for me on writing topics for this? I don't want to compete on a national search level against really solid content that is already really well covered, I just want to try to write blog posts that are relevant to small businesses in my area. I am in a fast growing mountain town, with lots of new businesses, mainly stuff like craft breweries, restaurants, home improvement, home construction. Marketing is the same for national and local businesses, having lots of citations and a verified Google My Business account with a local address may very well give your content on the same topic better results locally. I'm a blogger, writing for others currently via UpWork. I love writing, it comes easily to me and I'm opinionated. I'm also in love with the 90 day challenge you've mentioned here and want to dive into it headfirst. I can set up the WordPress, do the SEO and stuff easily, but will definitely look at what you have to say on them as well. I'm currently wondering what I should write about. I know so much about cooking, parenting and social media, and some about fashion and beauty. How do I decided what to write? Should I limit myself to just one, or write on all or some? Do I write different categories on the same website or create different sites? Sounds like a few categories in one website... Think of it this way, WHO is your target audience you want to help? Then... WHAT are their biggest problems they are searching to solve that you can help them resolve? From here it is just a bit of keyword research and practice.